Britain’s first robot Eric was created in 1928 by the First World War veteran and a noted journalist Captain William Richards (known as WH) and by the early aviator and aircraft engineer Alan Reffell, to replace George VI (then the Duke of York) in opening the Exhibition of the Society of Model Engineers in London in September, 1928. Captain Richards was secretary of the Society of Model Engineers, and when the Duke of York was unable to open the Exhibition of the Society on 20 September 1928, he decided to create a robot to replace him, using the help of the engineer Alan Reffell, whom he knew from his service in the air force. Richards was also an amateur engineer, keen on models and early technology. He must have been quite intrigued by Karel Čapek’s play, Rossum’s Universal Robots (R.U.R. ), performed in London in 1923 and which is credited for being the first time the word robot was used. Thus Eric was born with RUR emblazoned on his chest. At the appropriate time on that date in the Royal Horticultural Hall, Eric Robot arose, bowed, looked to the right and the left, and with appropriate gestures, proceeded to give a four minute opening address, as sparks flashed from his teeth. Eric robot cost only £140 to build, weighed 45kg, was 180 cm tall, and had light-bulbs for eyes. It was operated by two people, and his voice was received live by a radio signal. Eric was able to able to stand, from an initial seated position, to turn his head in the direction of onlookers, to raise his arms, and to talk. 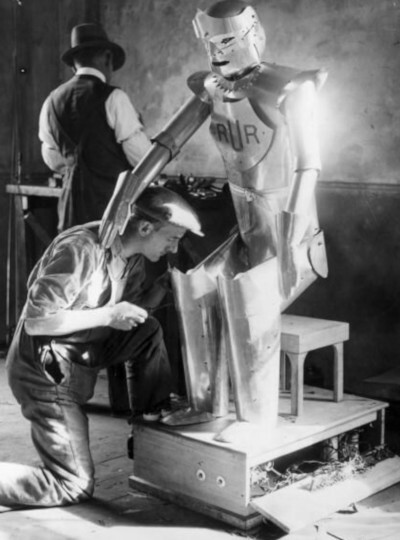 The Eric robot was so successful that after his appearance he embarked on a world tour, amazing crowds in Britain and Europe, before vanishing forever after the US tour in 1929. Eric Robot, "the perfect man," made his first public appearance in America on the stage of the John Golden Theater, 58th St. and Broadway, yesterday afternoon. Eric arrived from England with Capt. William Henry Richards, secretary of the Model Engineering Association of England, 14 days ago, and plans a tour of the continent. Eric is the mechanical man invented by Captain Richards after many years of private experimental work, and was exhibited before the public for the first time 17 weeks ago in London. Eric is made of aluminum, copper, steel, miles of wire, dynamos and electro-magnets. His eyes are two white electric bulbs, and his teeth, or rather tooth, is a blue bulb which, on the command, "Smile, Eric," appears, accompanied by a sputtering sound. 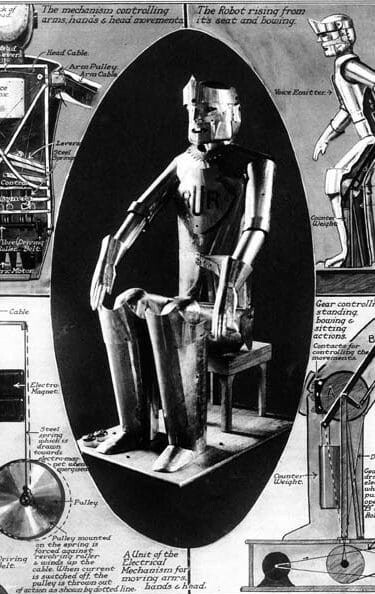 The upper half of Mr. Robot’s body, Captain Richards explained, is devoted to the speaking mechanism, and the rest to the movable parts. Eric made a five-minute speech yesterday, talking in an ordinary male voice. Eric was bombarded with questions by the audience, and having been posted with answers to hundreds of probable questions, made a fairly good showing. 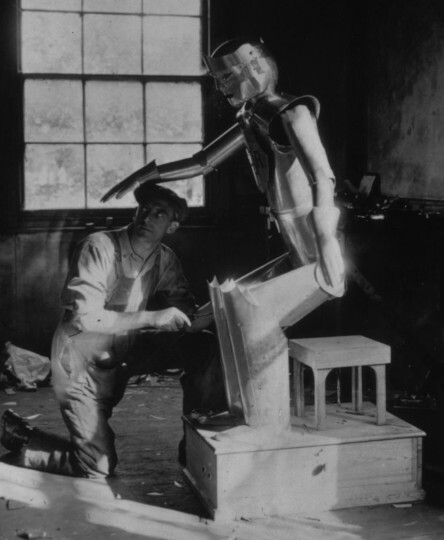 Richards went on to conceive and have built an improved robot George in 1930, which he further co-developed with his son, W.E. (Ted) Richards, a motor engineer and WWI veteran. They traveled extensively together promoting George culminating in a tour of Australia in 1935-1936. Eventually the outbreak of the Second World War in 1939 seems to have put an end to this activity. 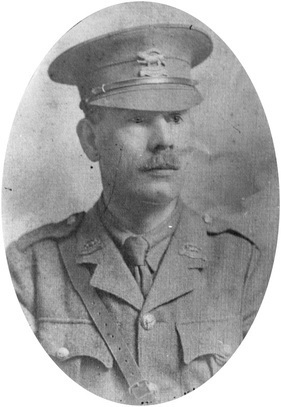 Who was Captain William Richards? William Henry Richards was a man who wore many hats! He was born near Totnes, Devon, England in 1868. He began his civilian career as a printer from which he progressed to becoming a journalist. He and his first wife, Thirza, had four children and eventually settled in Camberwell, London. In late 1890s Richards became a soldier, having served initially in the Royal North Devon Hussars, then in Imperial Yeomanry, which arrived in South Africa in March 1900 and took part in the Boer War. During the First World War, he served in Turkey (Gallipoli), then in Greece, Egypt, France and Flanders, where it appears that he was a war correspondent. After 1919 Richards was a journalist for the Plymouth-based Western Morning News, and later, the Manchester Guardian, The Illustrated London News and the Daily Sketch. He was a member of the Press Club in London and later as he became more entrepreneurial, he was the proprietor of the London News Agency in Fleet Street, a specialty agency involved in sales and marketing. Richards was widowed in 1929 and remarried in 1930 to his secretary, Winifred. Richards retired to a country cottage in Gomshall, Surrey, where he died on Christmas day (25 December) 1948, aged 80 years. Who was the engineer Alan Reffell? Alan Herbert Reffell was born on 14 March 1895 in Shere, Guildford, Surrey. His parents were William Joseph Reffell (1859-1931) and Kate Maria Boorer (1869-1909). He was the second of three sons and also had four sisters. Alan Herbert joined the Royal Flying Corps as an Aircraft Mechanic before the outbreak of the WWI aged only 18 in 1913. During the war he served in a number of squadrons including some in France, and was awarded the 1914 (Mons) Star, the Victory Medal & the British War Medal, and French Medaille Militaire. In 1919 he was transferred to reserve and in 1921 he was discharged. Reffell married Violet Mary Durant (born 1897) on 21 November 1915 in Guildford, Surrey, and they had two sons: Roger Alan Reffell (1918-2007) and John L. Reffell (1920-1920). Reffell was a holder of two patents in Britain and USA for flotation gear for aircraft from 1932 (GB695198 and US1956494). After the First World War, Alan Reffell ran a motor business in Gomshall Surrey, and worked on a number of interesting projects, including Eric Robot. He carried on his motor business between the wars and later expanded into making engineering lathes for a World War II government contract. Alan Herbert Reffell died on 26 October 1979, at Crawley Sussex, aged 84.